Promote your organisation or corporate brand name and logo with our new Printed Thermal Mugs and be sure to grab some attention! 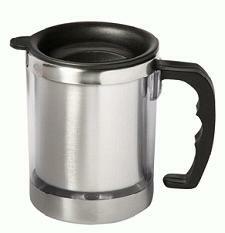 Sleek and stylish, this chromed thermal mug will insulate and keep your hot beverage hotter - for longer and the result ? No more luke warm drinks in the winter months. Customise your screen print logo on its surface and hand them out to customers as the perfect business gift?